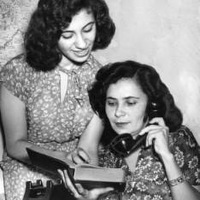 Born in 1908, Esther Davalos was born as a third generation American; her family came from Spain and settled in the part of Mexico that later became Texas. After the Mexican Revolution, which her father fought and died in, the family moved to Pennsylvania in 1918 to seek out better jobs for Davalos’ older brothers. After originally settling in Eddystone where her brothers worked for the Baldwin Locomotive Works, the family moved again to the Fishtown neighborhood of Philadelphia where Davalos grew up, married, and spent the rest of her life in. As an adult, she worked as a Spanish interpreter for many locations within the city including a health center on Girard Avenue (that still stands today) and the Nationalities Service Center. “Esther M. Davalos (1st interview),” Philly Immigration, accessed April 19, 2019, http://phillyimmigration.nunncenter.net/items/show/840.